QUEEN - THE COMPLETE WORKS Vinyl - Complete LP set - Freddie Mercury Signed? NR! There is no reserve and no buy it now. This is the complete, unplayed collection of Queen's vinyl albums. The box is a little creased on the top, so please see images. It was purchased around twenty years ago from a record shop that was closing down. The Freddie Mercury picture in the accompanied brochure is signed. There is no provenance for this and so is sold as seen. Queen The Complete Works Vinyl boxset. This item is not in shrink wrap but the records have never been played. The outer black presentation box has minor scuffmarks on it but therecords, record covers,book, map and itineraryare in very good condition. 14 x vinyl albums in white LP covers, numbered with roman numerals. 1 - 13 albums are the first Queen album through to The Works album. The 14th album, called 'Complete vision',features bonus tracks.1 x book featuring all of the included album cover artwork and release details. 1 x Queen tour itinerary from 1971 to 1985. 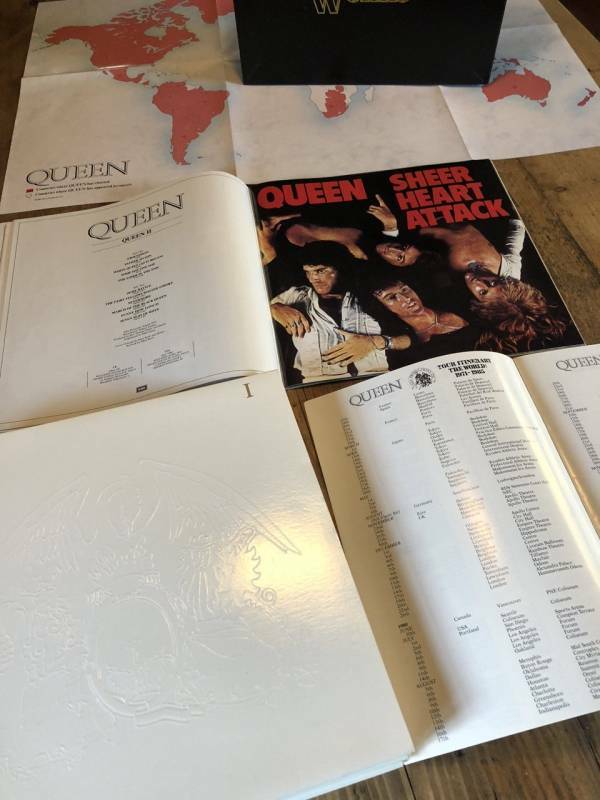 1 x Queen map of the world highlighting the countries in which Queen charted, and the countries in which they appeared live. This is a nice example of the complete set and would suit any Queen or Freddie Mercury fan. The item will be sent promptly and packaged securely and despatched using a insured and signed for service.